Good quality. Reasonable with fast delivery. this item should measure the heat very quickly but it does not !!!!!!!! BEWARE. Items seem like knock offs. Low quality. I do not recommend. It didn't work when we received it, but my husband was able to fix it. Very long delivery. Tried 3 different new batteries. Never would work. Junk. Unit works OK but complicated and slow. It's calibration time was very slow, should have spent more, wifey is not happy. The thermometer doesn't read temps instantly, instead it takes about 2 minutes. 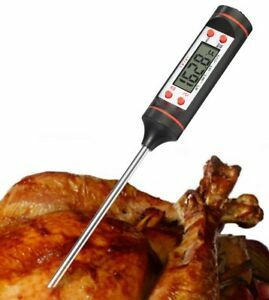 This cooking thermometer is so cool..It has a nice long probe for larger cuts of meat and when inserted the temp. begins registering very quickly. I ordered 2 as the price was so good. Love the tube packaging as you can store the thermometer and the extra battery in it taking up almost no space. This Thermometer is rather cheaply made. It functions almost like it should but it is not a fast reading thermometer. I'll find another brand as I had never heard of this brand before. The selling price was great.. just a low quality item. THe digital readout is perfect and easy to read, the handle placement is good, and the value was terrific. I searched in several stores after receiving the product and found that the same product was far more expensive should I have bought it retail. Great buy. Very good construction and quality. Had one and got another one as a gift. Better than glass ones which can break upon exposure to fast temperature change. Only drawback is that it has battery, so will have to replace some time (hopefully not so soon). It has some level of waterproof enclosure (I try not to wash it so survived occasional splashes so far), those red O rings are rubber that prevents splashes coming into the electronics. I am mostly using it to keep the temperature of the milk for in home yogurt making (to be able to incubate at 45 degrees celcius). Also it takes some time (albeit around 30 seconds) to stabilize the temperature because of weak heat transfer from the steel to the sensor. One thing to improve could be adding some small amount of material inside between the sensor and the steel so it could reach the correct measurement faster. Accuracy is good enough, I had two that I placed in the same water sample (should read the same temp.,) and they would be within 1.5 degrees difference. Also tested on freezing and boiling water and they were both well calibrated (freezing temp. should read 0 C, but check boiling water temperature at your altitude before attempting this check). Overall I am very satisfied by this temperature probe, I could even use it in the lab if there wasn't enough funding to buy scientific ones.